View More In Tool Pouches - Page 4. 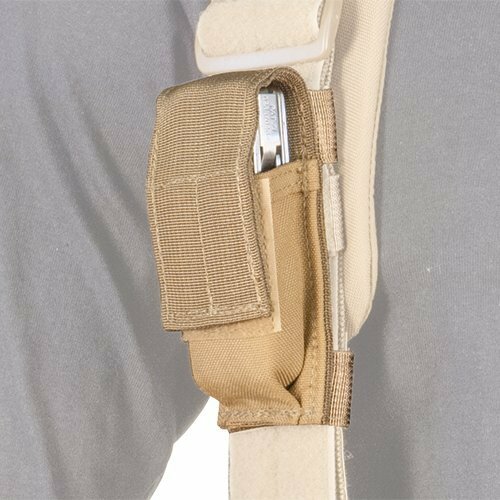 The Suspender Attachment Multi-Tool Pouch securely attaches your multi-tool to your A46 suspenders, making sure it is always there and quickly accessible. SPECIFICATIONS: Size: 2"w x 2"d x 5"h| Weight: 0.1 lbs. DURABLE: Rugged construction to last a lifetime. Semi-rigid design holds shape while empty. SECURE: Secure hook and loop closure, plus hook attachment points on rear to secure to loop on A46-CTS. Hook and loop flap closure keeps your multi-tool securely stowed. This attachment is an add on for the Atlas 46 suspenders, making sure that your tools are always there and aeasily accessible. PREMIUM CONSTRUCTION: Hand crafted and Made in the USA. If you have any questions about this product by Atlas 46, contact us by completing and submitting the form below. If you are looking for a specif part number, please include it with your message.